Blackhavens Farm - Updated March 17, 2019 We are expecting lambs and kids this week.The newest addition to the farm Sig. We are expecting lambs and kids this week. The newest addition to the farm Sig. Blackhavens is a small farm located in Southeastern Ohio. We are now in our 18th year of having Icelandic Sheep. Our starter flock of sheep came from Schul Icelandics in 2001, we purchased 2 ewe's and 4 lambs and a livestock guard dog was part of the package. In 2004 we added a few Nubians, what a joy to have our own milk. Free range chickens roam the farm and supply us with eggs. We came to realize that if we were to raise small animals it was essential that we have some protection for them. Over time it became obvious that we needed more than just one dog as our flock was growing and we hear coyotes on a regular basis. It was important for us to find dogs that came from livestock guarding lines. Our first Great Pyrenees was Holly then Amos came into our lives, then Joy, Dancer, Simon, Keeper, and now Grace. In 2005 we added our first Icelandic Sheepdog Poppi to the farm, in April 2007 we added a second, Brana, and in April 2011 we added our third, Lisa. 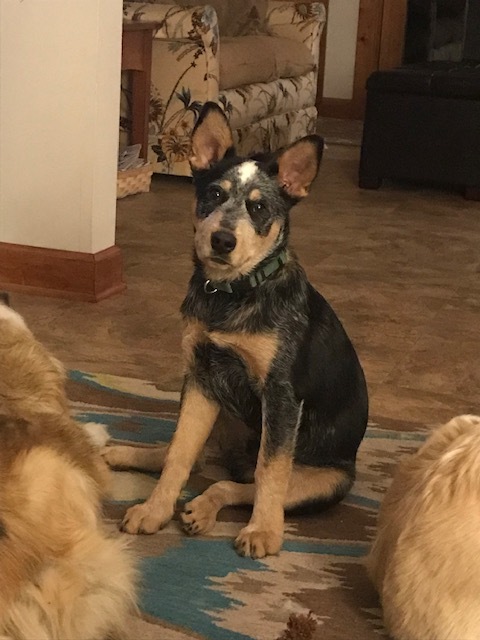 Sig joined the farm in Dec. 2018 he is an Aust. Cattle Dog. As you search our site I think you'll see that we truly love our life on the farm, and we are so thankful for all it gives back to us.